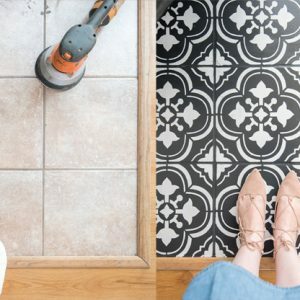 Have you ever thought up a DIY project in your head and then after you completed it it turned out just as good if not better than your imagination?! 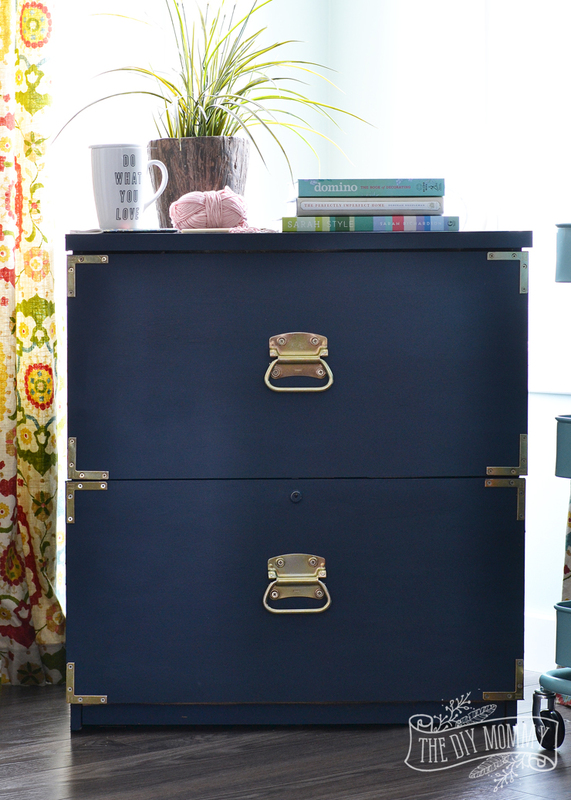 This is how I feel about this campaign dresser inspired makeover I just completed on our icky old filing cabinet. With the help of The FAT Paint Company, I was able to give a piece I was THISCLOSE to throwing out a gorgeous new life. 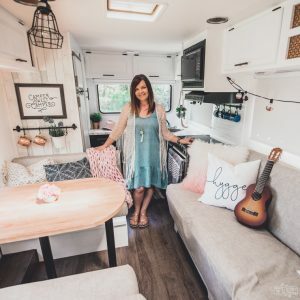 Let me show you how I did it, and make sure to scroll down to the bottom of this post to see a video tutorial and to enter to win the new Amanda Forrest FAT Paint collection for your very own PLUS a room makeover from Amanda herself! However, at $1200 this piece was out of my price range. 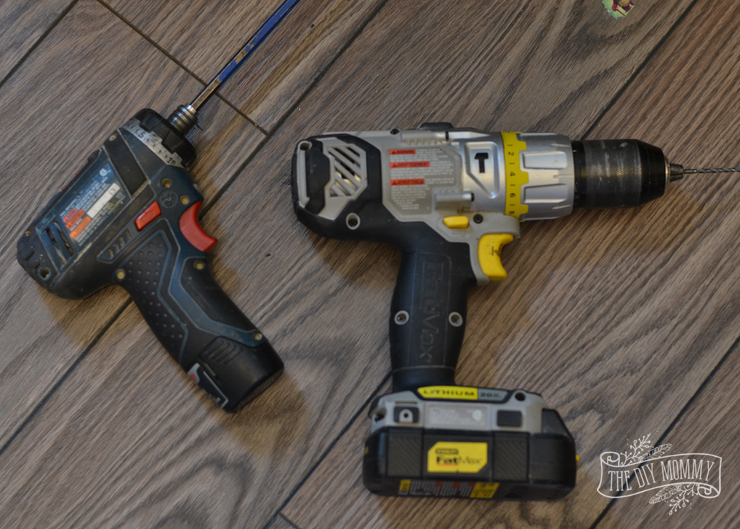 I filed away this combo in my brain for a potential DIY project. 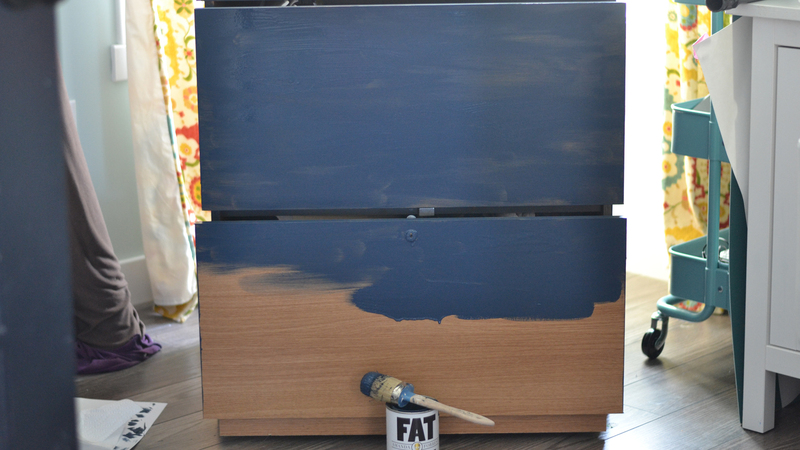 When The FAT Paint Company sent me some samples of their newest collection – The Amanda Forrest Collection – and I saw the gorgeous “Navy State of Mind” colour, I knew exactly what I wanted to do. … into a beautiful statement piece for my craft room office. 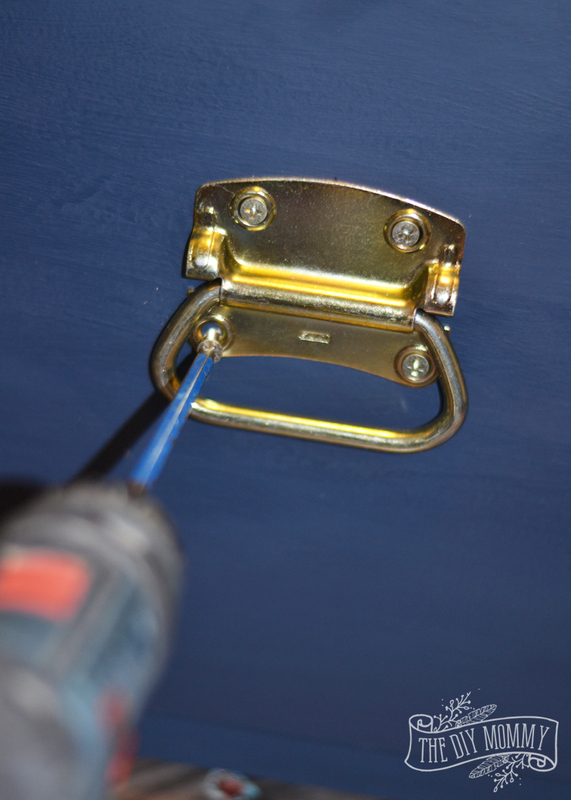 I knew that painting it in Navy State of Mind and giving it some pops of brass through inexpensive hardware would give it just the lift it needed. It looked pretty in my head, but I wasn’t sure how I’d like it in real life. When I finished it up, I WAS THRILLED. Now I have the most gorgeous looking, most expensive looking piece of statement furniture in my office that’s also very functional. 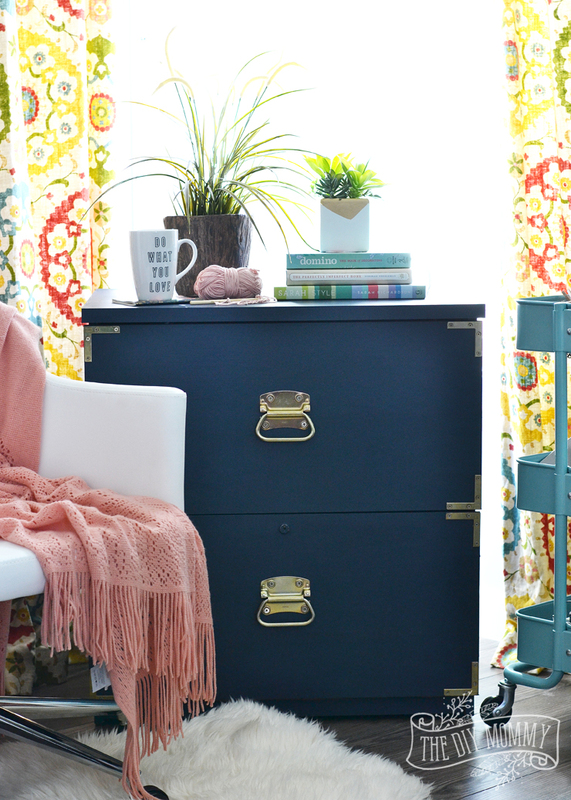 FAT Paint is a chalk style paint that’s a dream to work with. I didn’t even have to sand this laminated MDF piece of furniture or prep it in any way other than clean it for the paint to adhere. 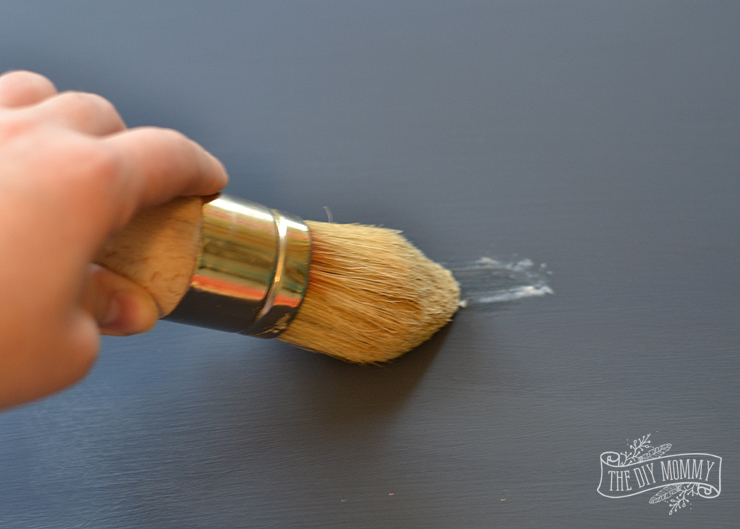 I used a natural bristled paint brush to apply the paint, and the finish is suprisingly smooth! I’m really impressed. I finished this project within a day – even with 2 little ones running around and “helping” me. 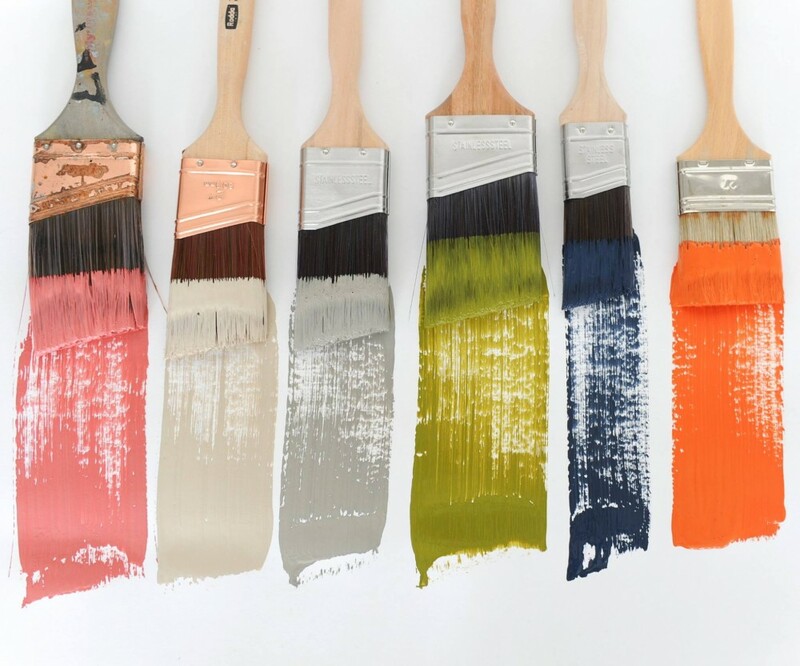 I love all of the colours in the Amanda Forrest FAT Paint collection. They’re all really on trend and so vivid. I’m not usually a navy-lover, but after painting with Navy State of Mind, I’m hooked! It’s such a gorgeous and unexpected neutral that looks great with all of my light & bright colours in my office. I also really liked “Greysful” and “Blushing Bombshell” from the collection. 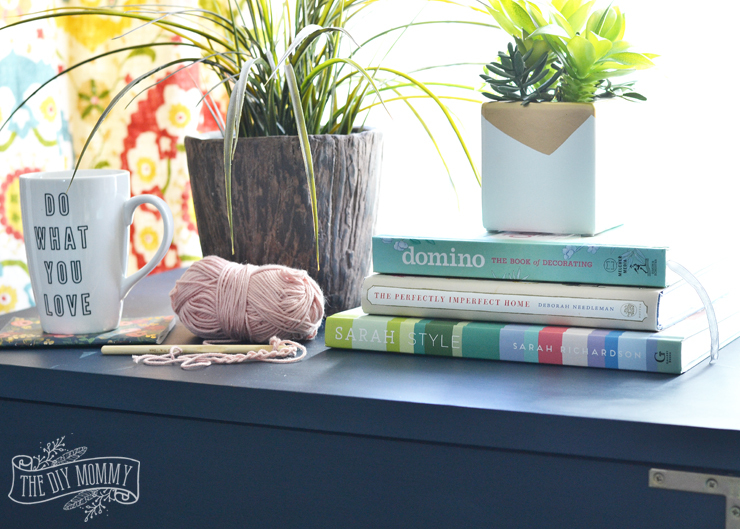 You’ll see little pops of those colours in my final office craft room makeover too. 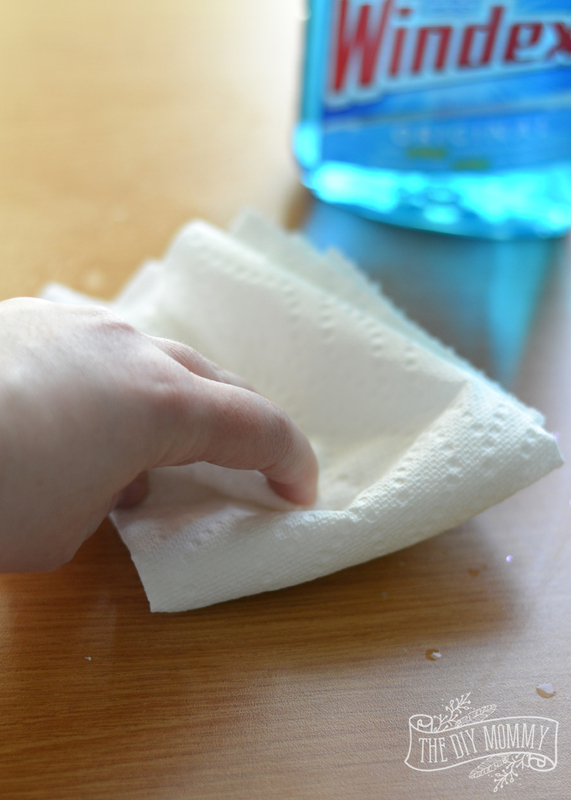 First, I cleaned all of the grease and debris off the filing cabinet with Windex. Next, I grabbed my can of FAT Paint in Navy State of Mind and started brushing it on the filing cabinet in long, even strokes. 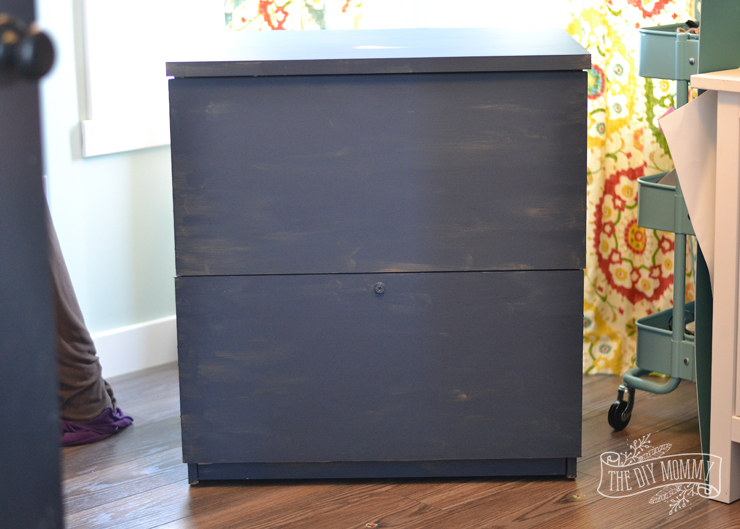 I painted the sides and top first, and then I painted the drawer fronts. I find the key is to keep all of the strokes going in one direction and don’t paint the same spot over too much to avoid streaks and brush marks. I only had to let the paint dry for about an hour before I was ready to paint the next coat. After two coats of paint, I felt the dresser had enough coverage and it looked great! Another wonderful thing about this paint is that it hardly smells at all which is FAB for painting indoors! 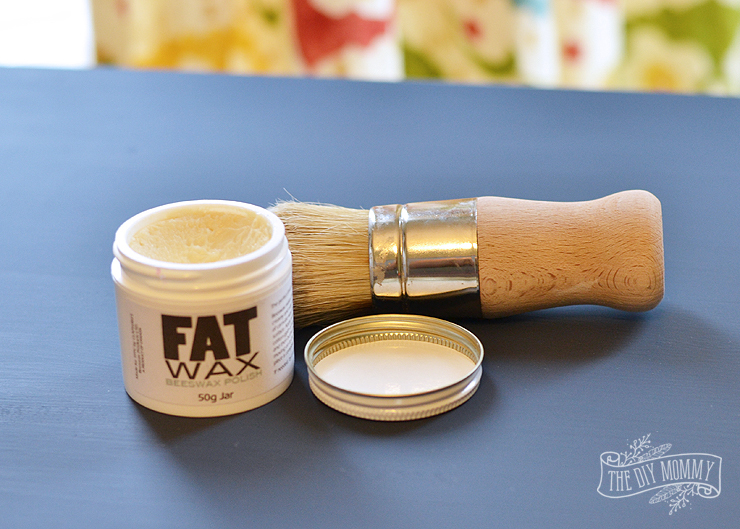 Once the paint was completely dry, I brushed on some FAT Wax Beeswax Polish. This stuff is SO cool and definitely one of the best finishing products I’ve tried for painted pieces. It provides a nice satin finish and it’s really easy to brush on. 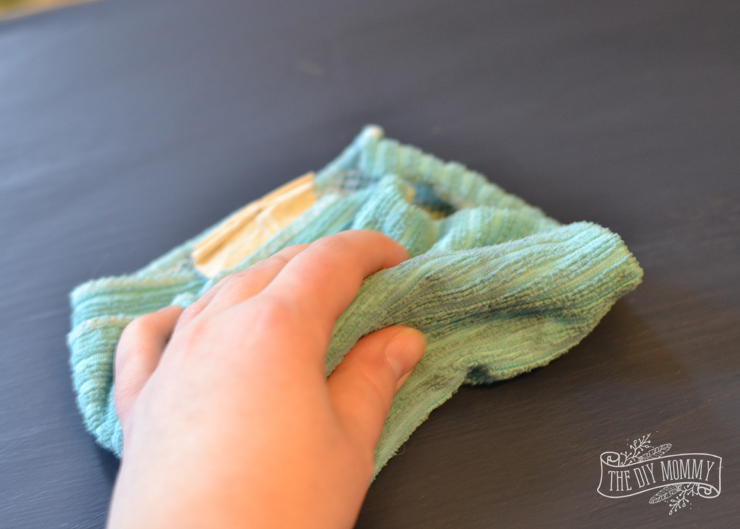 After brushing the wax all over the cabinet with a small brush I had on hand, I buffed it with a dry cloth. I swirled the cloth around the surface of the piece until the finish looked nice and even. Once the wax was dry, I was ready to add the hardware! 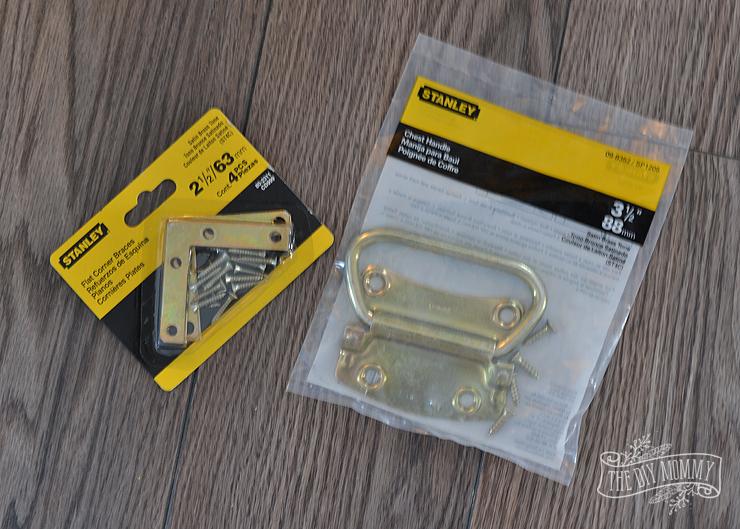 I found these brass corner braces and chest handles at my local hardware store in the utility hardware section. They were less than $4 for each package, and I loved how chunky and industrial they looked. 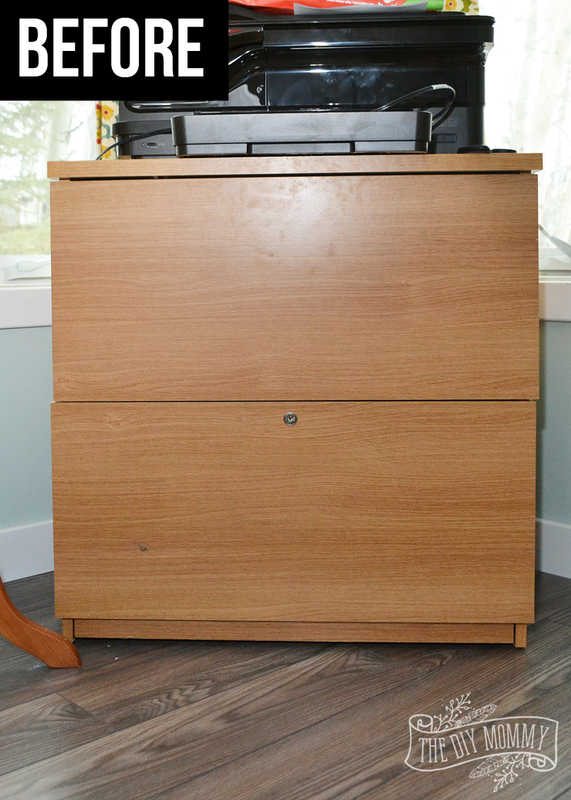 I marked where I wanted the corner braces and handles to go on the drawer fronts of my filing cabinet, and then I made little pilot holes with a drill that were a bit smaller than the screws that came with the hardware. Then, I placed the braces and handles on the drawer fronts, lined them up with the pilot holes, and screwed them in place with a drill. Don’t they look chunky and lovely? The brass against the navy is what makes me swoon! I also love how something as small as these little corner braces adds so much style to what was a very boring piece of furniture. 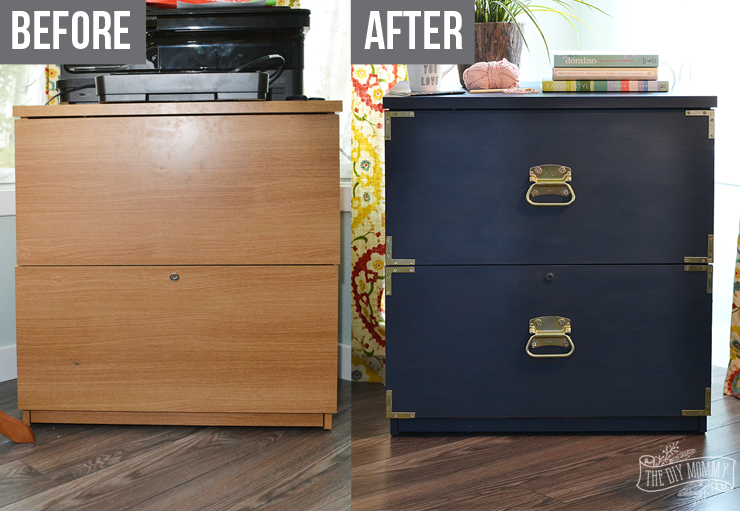 It’s so satisfying to turn what could have been junk into something so pretty… I can’t stop staring at my old-new filing cabinet! 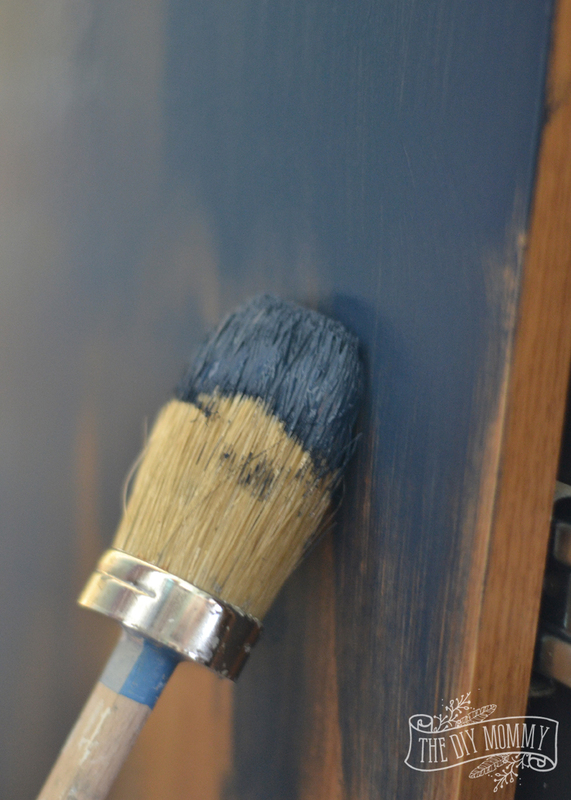 This technique using FAT Paint and utility hardware could turn any simple piece of furniture into a campaign dresser style piece. Give it a try! 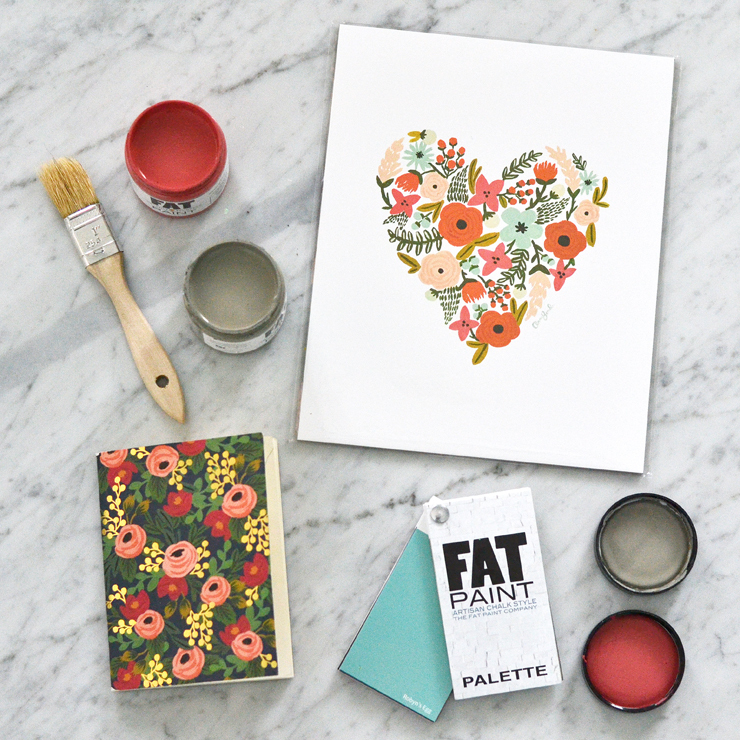 Now it’s time to enter to win your very own Amanda Forrest FAT Paint Collection! One winner will receive the entire Amanda Forrest Collection line of paint in pints and a 200g jar of Natural FAT Wax PLUS a virtual room makeover from Amanda Forrest herself! With simple photos, some basic measurements and a budget parameter provided by you she’ll design a room concept that you will lover. With an easy to follow designer plan in hand you can move forward confidently and implement the design yourself. Amanda Forrest will also be presenting at the Calgary Home + Garden Show this weekend, so if you live nearby you’ll want to check that out! Amazing transformation! 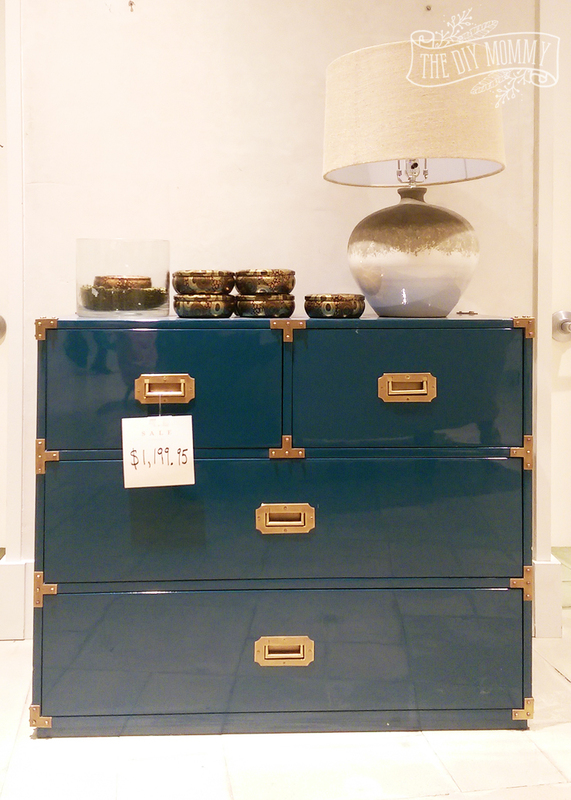 I was just thinking that I need a piece of furniture that can double as a filing cabinet, thanks for the inspiration! What a great makeover!! I love it! That looks amazing! I am in love with Navy lately so I’m loving that paint! I may need to pick some up for projects for my nautical decor. This is stunning! What you did with that piece is amazing! I have a similar filing cabinet that I was thinking about getting rid of. Not anymore! Thanks for the inspiration. This really did turn out great!! I can’t wait to share this. Navy State of Mind is my fave. 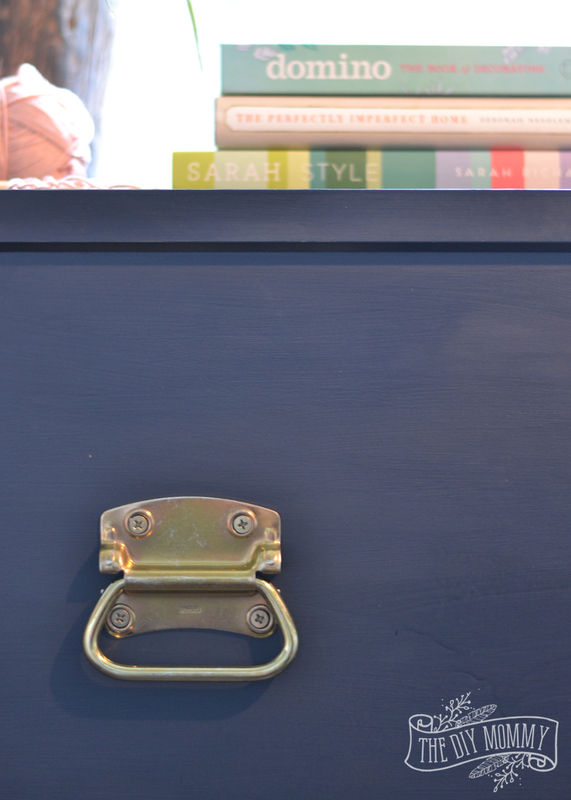 I love most of the colors, but I am on a hunt for the perfect navy paint right now, so I would have to say I am eager to try the Navy State Of Mind! I love the gorgeous coral color! I really like the Blushing Bombshell. What an amazing transformation! I would have to go with the Navy or Greysful. Love the navy. Beautiful transformation. This looks amazing! 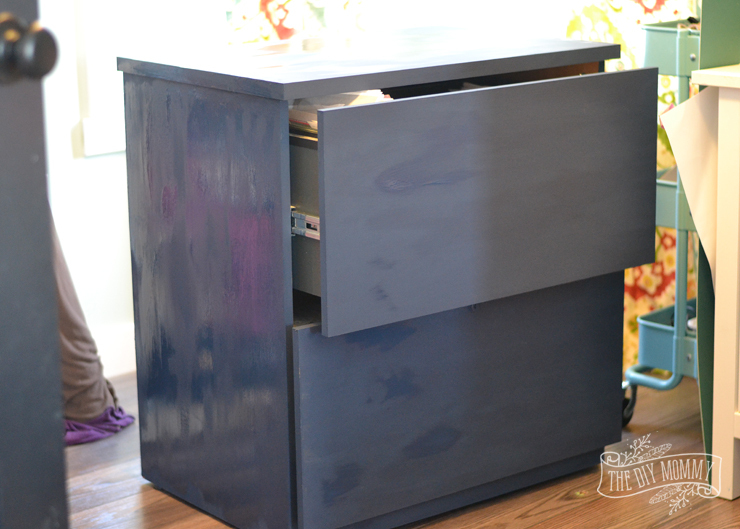 I have an old metal behemoth filing cabinet, and I’m always looking for inspiration to make it look better. I love the pulls you chose. Very well done. Love those colours – so awesome!! Great job on the makeover too! It looks fantastic and the simple prep is such a bonus! My favourite colour is Can’t See Me Camo! That looks phenomenal, I love how it turned out! What an excellent makeover! So hard to pick just one colour, but I think couture Linen would have to the winner! What cool paint! I love them all, but the gray and pink…together! What a great makeover! These look great. Woah, that turned out GORGEOUS!! 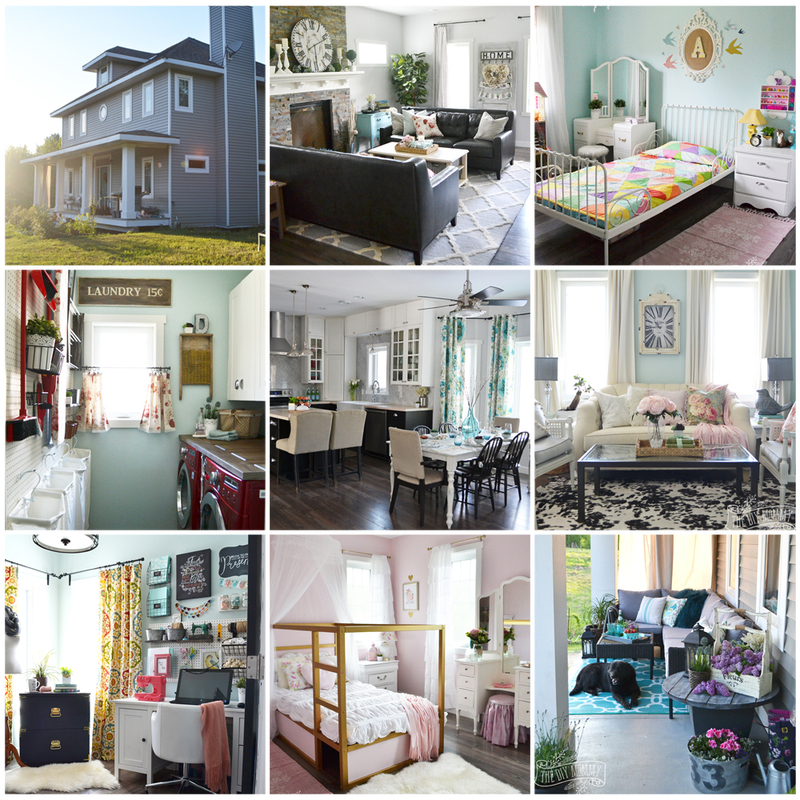 What a great job you’ve done – the colour, the hardware and the styling is beautiful!! Pinned, of course. Love the Navy State of Mind or Greysful! Nice job! I really love the color you used! Navy state of mind! I love this project! You’ve done an incredible job! I love what you did here, and am taking away a dose of inspiration for my own office pieces. My dad made my desk and there have been add-ons over the years… but I’m tired of it in its current state. Your ‘before’ and ‘after’ are amazing! Off to pin!! Sheila Zeller recently posted..Industrial Designer Eva Zeisel… Do You Know the Doorknob Style? WOW! you did it. It looks gorgeous, even better than the Anthropolgie one. Fabulous. Love the navy and gold. love! I really like the photos in this blog post. It is clear and really shows what FAT paint can do. My fave color is Can’t See Me Camo – can bridge the gap between light and dark furniture pieces. I have both pieces in my house. This is gorgeous! 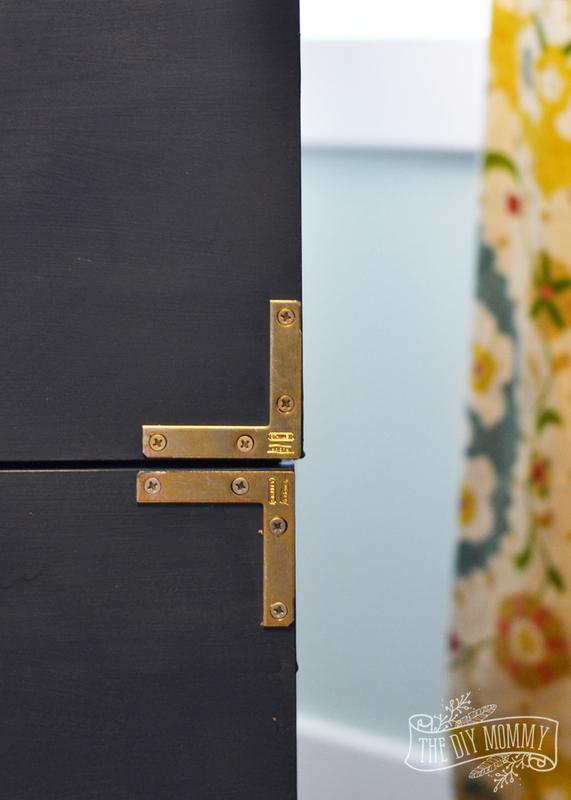 What a huge difference – I love the color with the gold hardware! What a transformation. Unfortunately, I never would have seen the potential in that ugly brown box. Congrats on your talents. Orangeapalooza is “our colour”. I can’t get enough of it. Thank you so much for hosting. 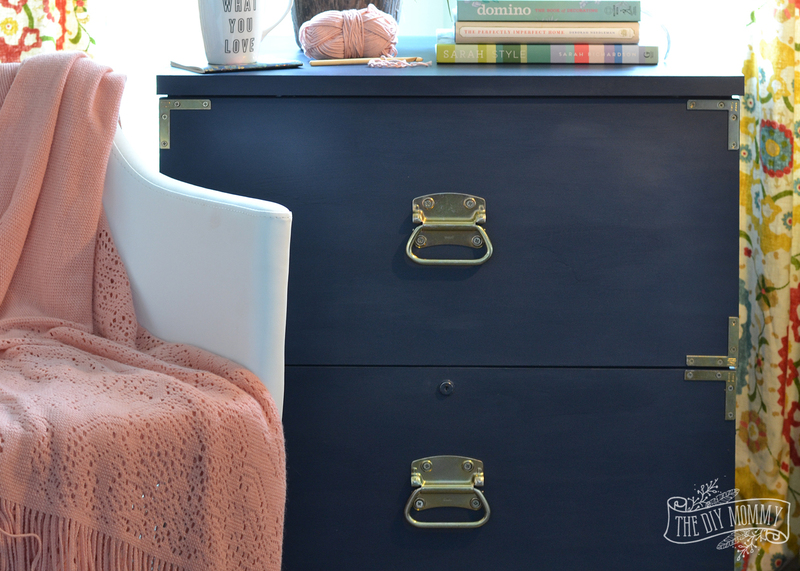 Love this project, can’t wait to try this on my filing cabinet! Wow, Love the new look! I really like the Blushing Bombshell! Wow! What an amazing job!! 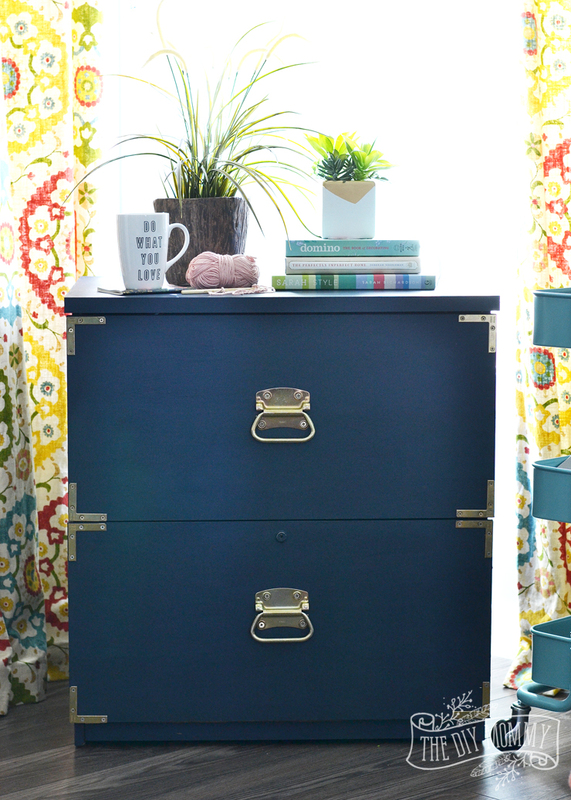 I want to do that because I really need a filing cabinet but they’re so ugly usually lol! Thanks for the great post – my fav colour is the blushing bombshell – I love that pop of brightness. I have teals, grays, and blues in my home with a pop of coral in the living room 🙂 I wish there was a coral colour in her paints! my favourite colour is Blushing Bombshell. I love love love what you did with your make over! The filing cabinet looks a zillion times better! All of the colors are great I love the color Peacock. I really like the Skyline color. I have an old dresser, you’ve inspired me to consider refinishing it! I like the braces idea on the corners, and seems fairly simple. what a stunning makeover!! such high impact for such a small piece. way to go!! It’s a hard choice but my favourite has to be Greysful. I love the Greysful color. The Blushing Bombshell is my favorite. Couture Linen is my fave! Partial to earth tones – dark winter colors blues/greens/burgundy & greys. The Wasabi – a personal standout – would opt for this color in our basement recreation room. Love the couture linen shade! My favourite shade from the collection is the couture linen. I really, really like Blushing Bombshell. I like Couture linen, will fit in nicely in all room decores. Orangeapalooza is nice for a dining room, do you not think? Blushing Bombshell is really nice. I’ve had a thing for green lately so I would say Can’t See Me Camo is my favourite. I think my fave there is the blushing bombshell. It is beautiful! I love the Greysful shade! Wow, what a difference. That looks great….love it! What an amazing idea!! I would have never thought of this. I love it! Would this work with metal? Yes it would work 😀 chalk style paints stick awesome to metal!